Review: First, I want to say that I was on an emotional roller coaster throughout this entire book. I started off not fully liking the novel. It made me think "I'm so glad I'm not in high school any more! ", because in all reality there was some hard truth to this novel. Sam Kingston goes along on her day how she always would, getting a ride from her best friend and leader of the pack Lindsey, while the other girls Elody and Ally tag along. They could be classified as a clique; the people you love to hate. Their actions and words are hurtful, but they get laughter and pride from it- people join along and they feed off it. As I read, I was upset by the stuff they were doing and how Sam went along with her friends- did things to please them- although you could tell she didn't always agree. A small accident changes everything... especially Sam's life. How would you feel living the same day over and over again (until you finally got it right)? Honestly, I think it would be exhausting. There were times throughout Before I Fall that I wanted to say "enough already!! Can't Sam just change everything. Wake up from death or wherever it is she's at." I would like to applaud Lauren Oliver for taking so many issues that teens face now days- she takes realistic situations and turns it into a beautiful novel. People don't live their lives over and over again after they are dead, until they are able to 'do the right thing' and clear their conscience. But bullying is a real subject, along with the harsh consequences that come with it... suicide. We may not be able to change the outcome once we are gone, but there is a clear message that maybe there is hope for people so they don't get to the point of suicide. Teens need to realize that although their actions may be all fun, laughter and games... it hurts and to someone, anyone, it could mean life or death. A penny for my thoughts, oh no, I'll sell 'em for a dollar. This reminded me of Sam- how once she knew she died, she tried everything she could to change the things around her. At first it was to save her life, and then she started paying attention to her surroundings and noticed what she had been doing wrong. Juliet was a victim of Sam and her friends, they bullied her- once she was gone, Sam finally decided it was time to change things; that her words and actions do have an effect on people there fore she needed to try and stop Juliet from killing herself (over and over) before it was to late. I enjoyed reading Before I Fall... there are a few parts that were repetitive (which is understandable because Sam lives the same day over and over again) but could quickly become tiring reading that part over again. 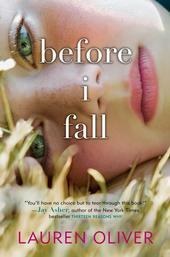 But other than that, I really enjoyed Before I Fall. I would recommend this book for the older Young Adult crowd. I have not read this book. Now I need too!